Applying to upper secondary education, vocational education and higher education in Finland is done either through joint application or separate application. Make sure you apply in the right application procedure. The Finnish joint application is a national application procedure the Finnish education institutions use when selecting new students to general upper secondary schools, vocational institutions and higher education institutions. The application times vary between the levels of education. With general upper secondary schools and vocational institutions, applying usually takes place in February-March. Higher education institutions have two application times, the first in January and the second in March-April. Applying through joint application is done with one form. You can apply to a maximum of five (upper secondary and vocational education) or six (higher education) study programmes which you should rank in the order in which you wish to be selected. The order is binding and you cannot change it after the application period has ended. Read more about applying on both application periods for higher education study programmes. Please note that education given in foreign language (other than Finnish and Swedish) is not always included in the joint application. You apply to these study programmes directly to the education institution in separate application. You should always check from the study programme overview if that study programme is in the joint application or separate application. 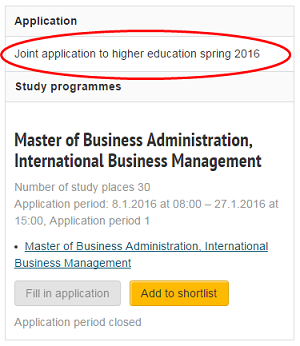 Read more about applying to upper secondary education in joint application. Read more about joint application for higher education. Read more about how to apply on joint application for higher education. In separate application, you apply directly to the education institution with separate application form for each study programme and education institution. This means that depending on the institution’s application procedure, you apply with separate application form to each study programme in an institution or with one separate application form to several study programmes in one institution. There are no limitations to the amount of study programmes you can apply to in separate application. 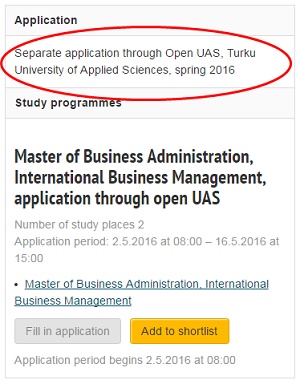 Most of separate applications are done in Studyinfo. Read more about separate application for higher education. Read more about how to apply on separate application. What is supplementary application round? Supplementary application round takes place if all study places offered during the joint application period are not filled. Admission criteria are the same as they were in the primary application round. Applying for study programmes in supplementary application round’s joint application takes place on different times depending on the degree programme level. More information will be given before the applications periods begin.